Voilà another photo treasure! This time, the choice is somewhat different from the other photographers and artists that I have introduced so far. I know Trey Ratcliff rather because of his ubiquitous online presence (blog, portfolio, google plus, Flickr, Facebook, Twitter, videos and others) than his photography. One of the reasons is that he is famous for HDR photography and tutorials, which is a type of photography or developing that does not resonate strongly with me. However, Trey Ratcliff does not limit himself to HDR and my indifference to HDR is not a statement of value but only of personal taste. I particularly like the photograph below. It is a simple composition, with a prominent eye catcher and the rocky and grassy middle ground leads the eye to the building. It is also very nice how the photograph disappears in the fore- and background and becomes almost invisible (particularly on a white screen background as on this blog). I would also like to mention that Trey Ratcliff is known as strong advocate of creative commons licensing and as far as I know all his photographs can be downloaded at full resolution from his website. I think that Trey Ratcliff is very commendable for this very open approach to sharing and making photographs accessible to everybody (an encouragement for me and hopefully others to license photographs under creative commons). For me, Trey Ratcliff is the proof that what goes around comes around and that it pays off to believe in the honesty and good in women and men. It is fantastic to see this approach succeed and I therefore recommend you to visit Trey Ratcliff's portfolio or blog or to watch THIS interview at TWiT Photo (54:28 min). Early spring is a wonderful time to photograph man-made beauty in cities. The sun is low and creates long shadows, lights and reflections and the trees are still bare and project delicate shadows onto facades or other surfaces. Many of these lights and shadows are fleeting beauties and only observed during a few days when the sun peeks through street canyons for a few minutes. As mentioned in an earlier post, I am particularly fond of light and shadow compositions and the projections of trees attract me particularly. The shadows are diffuse or sharp and small or large depending on the location of the sun and the tree with respect to the facade. Buildings may look completely transformed and beautifully painted with a short-lived work of art. Often, it makes me wish to paint the shadows onto the walls. The tree shadows shown above could only be observed in early spring or fall. 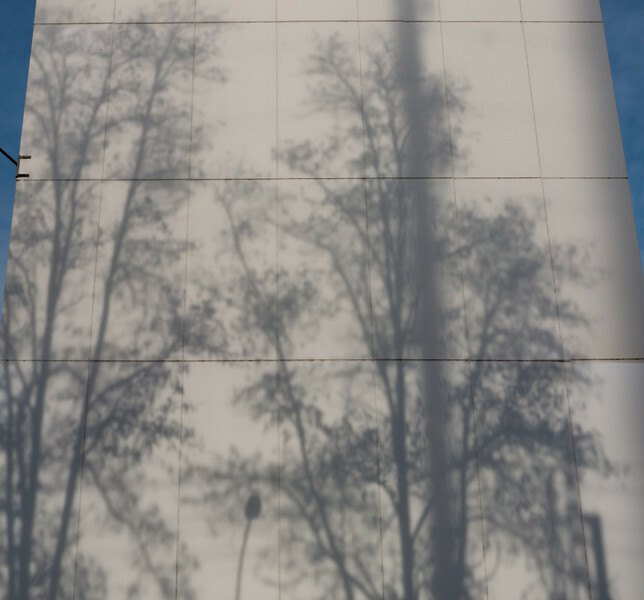 The giant facade served as a screen for the shadow play of Black Locust trees (Robinia pseudoacacia). It was a huge building and I had to stitch several photographs together to capture these shadows. The building has been torn down now and the trees are gone as well (an additional level of ephemerality). The photograph is part of a new gallery that I have just added to Florian's photos. The tree shadows are a spin-off from the Light and shadow gallery, but I was hesitant whether to count them as natural or man-made beauties. I decided for the latter, because all tree shadows have been captured in urban environments and the shadows are projected onto man-made structures. I hope you enjoy and I wish you a nice weekend! Many years ago, photography equipment was much more expensive in Switzerland than, for example, in the United States. The difference was so big that it may have been cheaper to fly to New York and buy your stuff there (especially big white lenses, which I neither need nor ever bought). That has changed. Now, there are many online shops that sell photography equipment at prices that are roughly comparable to those in the US and which can be drastically lower than in a regular camera store. I always thought that outrageously high margins of these camera stores are the reason for the price difference. I may have been wrong. Most likely, the camera manufacturers are to blame. In the graph below you see that the Swiss prices for the Nikon D800, the Canon EOS 5D Mark III, the Panasonic Lumix DMC-G3 and the Olympus E-P3 (with a 14-42 mm lens) are 21-51% higher in camera stores as compared to online shops. 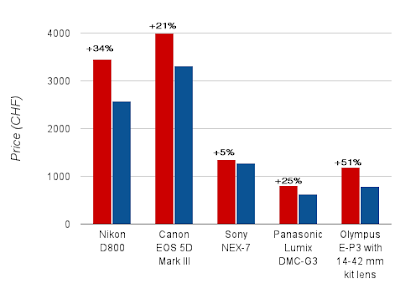 The only notable exception is Sony - the NEX-7 only costs 5% more at FotoPro than in the cheapest online shop. Needless to say that I wouldn't hesitate paying 5% more for the possibility to buy the camera in a "real" shop where I can talk to real people and even hold a camera in my hands before buying it. However, this is certainly not worth a premium of 21-51% (at least not for me). In the case of the Nikon D800, the difference amounts to a staggering 868 CHF, which will buy you a fine camera or lens! Swiss prices (in CHF) for the Nikon D800, the Canon EOS 5D Mark III, the Sony NEX-7, the Panasonic Lumix DMC-G3 and the Olympus E-P3 (with a 14-42 mm lens) in at FotoPro (red) and in online shops (blue). The percentage indicates how much more expensive each camera is at FotoPro as compared to the cheapest online shop. Therefore, it either seems that camera manufacturers (Nikon, Canon, Panasonic and Olympus) are completely unaware of the current currency exchange rates or simply think that people living in Switzerland can afford to pay 21-51% more for their products. An interesting side-note: The brand with the most honest price policy, Sony, is also the one that communicates its prices the clearest, while Nikon or Olympus do not provide their suggested retail prices on their Swiss websites at all. Maybe, the honesty and correctness in a brand's business conduct could and should also be a selection criterion when you shop for equipment. Of course, the same holds true for camera stores as well: Why would they accept the ridiculous prices (unless they also profit from these exaggerations)? Luckily, it is now easily possible to compare prices for any product around the globe and there are certainly much more severe cases than the examples shown here. The more surprising it seems to me that certain brands try to dupe their costumers AND seem to get away with it. Since correct conduct seems to be the minority, I think it is very highly commendable and should be highlighted. P. S. I am neither affiliated with any camera shop - online or regular - nor representing any brand. At the moment I do not even own a Sony camera (I did own a small Sony point-and-shoot camera many years ago that provided good service). People discover all sorts of hidden things in their surroundings. Photographers espy photographs. Like with many things, there are flashy, boastful and eye-catching photographs that are difficult to miss, sought by many but caught really well by only very few. Many people are attracted to these subjects, hunt them like treasures and collect them like trophies. However, appearances are deceiving and the most famous subjects may not be the most interesting. I have little interest in this (superficial) attractiveness and rather seek the hidden beauty of the common, the tiny details in my everyday life because they enlighten me every day. The photographs in the drapes and blinds gallery are an example for such secretive niceties. You may find worthwhile subject by observing light passing through curtains, by noticing the intricate patterns of wrinkles in drapes and fabric or appreciating designs of light and shadow created by the blinds of your office window. These motifs will change with the seasons and may only be observed a few times each year. I have just added the drapes and blinds gallery in the course of a reorganization effort of the man-made beauty section of Florian's photos. As announced in my last post, I have also continued removing the watermarks and right-click protection and everything is under a Creative Commons Attribution-NonCommercial-NoDerivs 3.0 Unported License now. I hope you enjoy and I encourage you to discover beautiful details in your everyday life!